411 backers pledged $13,659 to help bring this project to life. Instantly we were beset by requests, nay, pleadings to make this fictional barrier tape real. Clearly we struck a nerve, and now you can strike a blow for IT professionals everywhere by contributing to this project. We promise to post the funniest photos featuring the tape to the Not Invented Here blog. 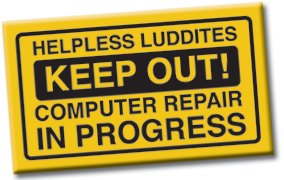 Each roll will consist of 250' of high-visibility yellow barrier tape with the following text repeating in black: HELPLESS LUDDITES KEEP OUT: COMPUTER REPAIR IN PROGRESS. The tape is 2" wide and 3mil thick and is not adhesive. The artist's rendition above is our best effort, but there may be slight differences in the final product. DELIVERING OUTSIDE THE U.S.? I'm embarrassed to say that I underestimated international delivery costs. We are willing to stand by the numbers quoted at right, but we are asking folks to add an additional $3 per roll beyond the prices quoted. UPDATE: Obviously bright yellow tape with an amusing slogan is its own reward, but as an incentive to spread the word (and possibly up your pledge), Not Invented Here artist emeritus Paul Southworth has agreed that if we reach the lofty level of $10,000 he will return from his luxurious retirement in the tropics to draw a week's worth of strips this summer. Many tears were shed when Paul left, so here's a chance to get another taste of his unique style. YET ANOTHER UPDATE: We made it past $10,000! So now every roll of tape will be accompanied by the above magnet. Furthermore we have added a $7 magnets-only premium, and you can add additional magnets to any premium for $2 each (remember to add an additional $1 per magnet for delivery outside the US). On behalf of hard-working IT professionals everywhere, our thanks for helping make this funny thing real. Want more than 3 but fewer than 10? Select the $55 "three rolls" level and add $18 for each additional roll. Want more than 10 but fewer than 30? Select this premium and add $17.50 for each additional roll. Want more than 30 but fewer than 100? Select this premium and add $16 for each additional roll. One roll of IT barrier tape PLUS we will feature a character based on you (with your name and likeness) in an upcoming Not Invented Here strip. Want more than 100 rolls? Select this premium and add $14.90 for each additional roll. One roll of IT barrier tape PLUS an acryllic reproduction of any the Not Invented Here strip in question (or your choice of any strips drawn by Jeff Zugale), hand painted by artist Jeff Zugale. Bill will visit your software company (at your expense if outside the greater Seattle area), spending the day handing out IT barrier tape and getting to know the business and people, and then make fun of it in a future Not Invented Here sequence.